Marblehead has its roots as a quarry town and the area still features an active quarry. 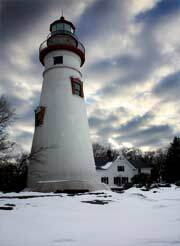 Besides the galleries and other shops found in the small town of Marblehead is the Marblehead Lighthouse. The first house was built in 1821 by John Kelly and his son using locally quarried limestone. In all it took them 11 weeks to complete. 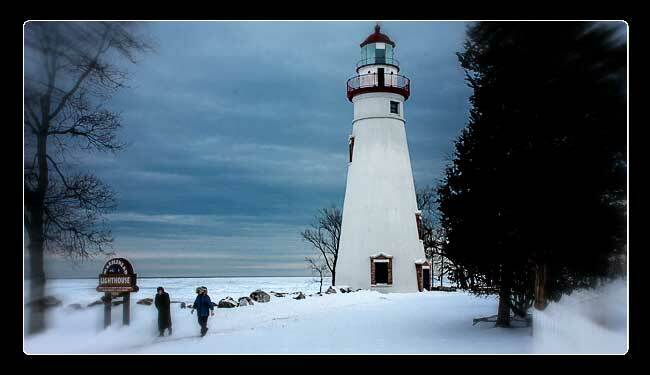 Marblehead Lighthouse is Lake Erie's best known and most-photographed landmarks. The grounds surrounding the lighthouse offer excellent picnicking and views of Lake Erie, Sandusky Bay, Kelleys Island and South Bass Island. You can even see Cedar Point Amusement Park from the lighthouse grounds. The Marblehead Lighthouse first began functioning in 1822 and is the oldest lighthouse in continuous operation on the Great Lakes. A museum, located in the Keeper's House is operated by the Marblehead Lighthouse Historical Society and open whenever the tower is open. Admission to the the museum is free, but donations are accepted. Inside the keepers house is historic items, one of the fresnel lenses and one of the new lights that was struck by lighting. There's also a gift shop. Tours of Marblehead Lighthouse are are offered on summer weekdays after Memorial Day until the Friday before Labor Day. Tours led by the U.S. Coast Guard Auxiliary may also be offered on the second Saturday of the month June through October. A small fee is charged to climb the narrow spiral staircase to the top. Folks wishing to climb to the top are warned that those afraid of heights or are claustrophic should not attempt the climb. 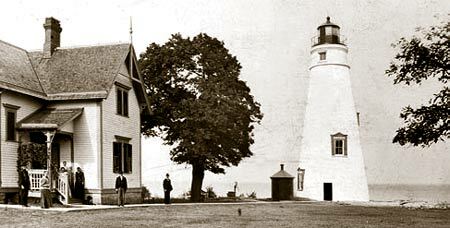 Marblehead lighthouse prior to adding a 15' extension to the top in 1903. In 1819 just 6 years after the Battle of Lake Erie in the War of 1812, the 15th U. S. Congress recognized the importance of having navigational aides along the Great Lakes treacherous coast line to make water transportation as safe as possible. Congress authorized a total of $5,000 to build a lighthouse marking the entrance to Sandusky Bay. Contractor William Kelley built the 50’ tower of native limestone on the tip of the Marblehead Peninsula, then called Rocky Point. The base of the tower is 25’ in diameter, with walls 5’ thick. It narrows to 12’ at the top. Marblehead Lighthouse has had 15 lighthouse keepers, 2 were women. The first keeper was Benajah Wolcott, a Revolutionary War veteran and one of the first settlers on the peninsula. He lived in a small stone home on the Sandusky Bay side of the peninsula. Each night, he lit the wicks of the 13 whale oil lamps that were the original light fixture with a 16”diameter metal reflector projecting the light across the lake. Other duties of the lighthouse keeper included keeping a log of passing ships, noting the weather conditions, and organizing rescue efforts when necessary. 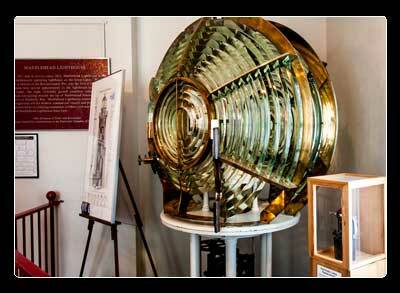 The original whale oil lamps were replaced by a single kerosene lantern magnified by a fresnel lens in 1858. The new lens created a brighter, more visible, white light. In 1880, the lighthouse keeper’s household moved to a new frame home next to the lighthouse that now houses the museum and in 1898, the lighthouse was increased in height and a new brick column was constructed inside the original limestone structure. Engineers did not believe the limestone would be strong enough to handle the additional height. The interior column added much needed stability to the structure and allowed for a much larger fresnel lens. In 1901 the light was raised again to its final height of 73 feet 6". Electric lighting replaced the kerosene lantern, dramatically increasing the candlepower of the signal in 1923. In 1974 the original limestone was repointed and coated with concrete. During this refacing the dome and trim were painted red which is how the light appears today. The big fresnel lens was replaced in 1972 with a plastic navigational beacon that automatically flashes a green light every six seconds. The Ohio Department of Natural Resources maintains the property surrounding the lighthouse and accepted ownership of the Marblehead Lighthouse tower in 1998. The U.S. Coast Guard continues to maintain the lighthouse beacon. Marblehead recently underwent extensive renovation to the tower and keeper's house with historic accuracy playing an important role in the renovation. Today’s 300 mm lens projects a green signal visible up to 11 nautical miles and flashes every 6 seconds. 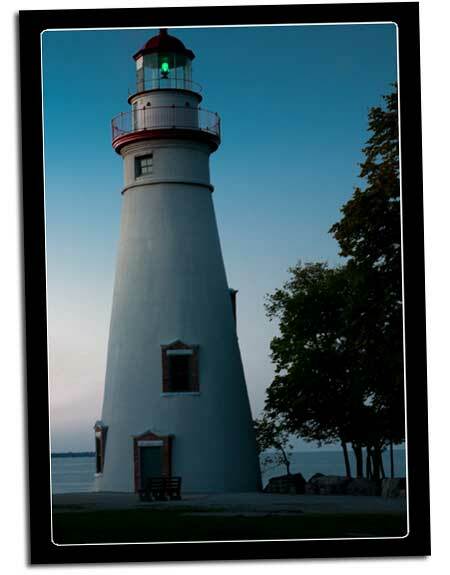 The green lighthouse light, distinguishes the signal from flashing nearby airport beacons. Each year more than 500,000 visitors come to this historic Ohio landmark. Even when the lighthouse is closed, the area is worth a visit to appreciate the beauty of the area, including the rocky shoreline. The lighthouse and keeper’s house sits on about 9 acres, with parking. The area is at the tip of the peninsula and is surrounded by the Marblehead community. 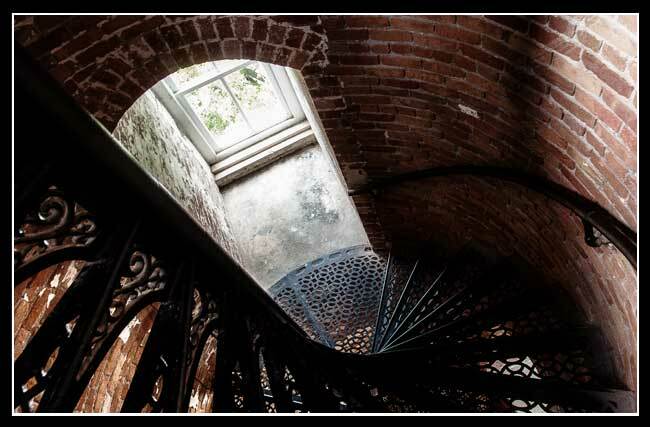 Tours of Marblehead Lighthouse are offered on weekday afternoons from 1:00 p.m. to 4:45 p.m. after Memorial Day until the Friday before Labor Day. In total area, Lake Erie is the 12th largest freshwater lake in the world and the most shallow of the 5 Great Lakes. It is about 210 miles long, 57 miles wide, with a shoreline of approximately 71 miles with a maximum depth of 210'. It served as a passage for early explorers navigating by canoe into the interior of North American and has since become a key link to commercial shipping on the Great Lakes. Lake Erie is an important water resource for recreating and tourism as well as for municipal and industrial use. Its warm, shallow waters harbor a diverse and abundant fishery, primarily known by anglers for walleye, yellow perch, and smallmouth bass.